Not long ago, I was introduced to a product, via Instagram, that embodies everything I'm looking for to take body exfoliation to the next level. When I think of the word "exfoliation," one term that comes to mind is microdermabrasion. Microdermabrasion is the grandfather of facial exfoliation. Before chemical peels were a major craze, there was microdermabrasion. In all my years in the skincare game, never have I heard of microdermabrasion for the body. I didn't know it was a thing until beauty expert Ashely Weatherford let us in on her little secret. 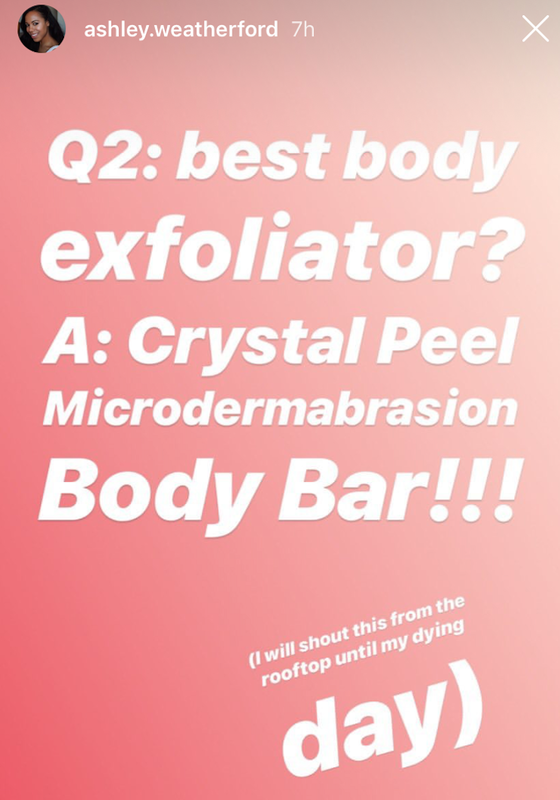 When asked to reveal her go-to body exfoliator, Ashley boldly proclaimed that Crystal Peel Microderm Body Bar was her absolute fave and that she'd scream this from the rooftop until her dying day. I love a dramatic proclamation of support for a great beauty product. So I was all ears. I immediately needed to know more about this exfoliating body bar and why she was so obsessed with it. Don't get me wrong, sugar scrubs are great, but sometimes I wish there was something that provided a more intense exfoliation. This soap bar contains some of the same crystals used in microdermabrasion machines. It also contains magnesium oxide crystals from the dead sea. The crystals are uniformly dispersed throughout the bar so that it's effective at removing dead skin from start to finish. If kept dry between each use, the soap can last up to 6 months if used daily. Daily exfoliation pays off in a major way. When exfoliated my body daily, my skin was beyond smooth and was even toned all over. When I searched for this crystalized infused bar online, I noticed that it cost nearly $30.00. At first, I doubted whether I should invest so much in a bar of soap....but then I remembered that microdermabrasion sessions are an investment in softer, smoother skin.....so I did the right thing. What really convinced me to purchase this skin bar was (1.) Ashley's strong recommendation and (2). The positive reviews on Amazon. 5.0 out of 5 starsSo much better than exfoliating goopy scrub.January 1, 2019My skin changed what feels like overnight and I spent the better part of the last 4 years moisturizing, scrubbing, changing soaps. Nothing helped. Bumps and ingrown hairs on my arms, elbows, thighs, knees. One use with this bar and my skin felt amazing and smooth the way it used to. I follow up with shower oil and find I only need to use the bar once a week. It's not messy like traditional scrubs and not a waste of goop stuck on your hands instead of scrubbing your skin. Apparently, this soap isn't for those with really sensitive skin. I plan to only use it on certain areas like my back and arms. Perhaps on my legs, if they can tolerate it. I can not wait to use it after a session in the sauna. In my opinion, the absolute best time to scrub the body is after a workout, post-sauna or after soaking in a warm bath. This loosens the dead skin and preps the skin for maximum impact. Some people in the reviews stated that the soap left tiny scratches. I think this could be avoided if used on skin that's already primed for exfoliation. They also offer a similar exfoliating bar for sensitive skin just in case. If the $30.00 price tag turns you off, no worries, they also offer this crystalized soap in a 2 oz trial size for a price that fits nicely within your beauty budget. I love this bar! By far the most intense scrub I’ve ever received! Not messy at all! I've recently bought this bar and am enjoying thus far. I also bought microdermabrasion crystals on Amazon in which I'm planning on mixing with liquid African black soap and sweet almond oil to make somewhat of a paste. I'm excited to see the results!